Our product range includes a wide range of puf insulated door, sandwich puf panels, puf roofing panels, puf insulated panels and roof insulated panel. We fabricate & install PUF insulated doors that are widely preferred by industrial clients. These are best suitable for their heat resistant & thermal properties. We offer PUF insulated door in different designs, patterns and dimensions as required by the client. Apart from fabrication, we install these are assure functional efficiency of these doors. Prefabricated Panels in various materials from pre-coated, G. I. S. S. either on both sides or two different materials inside and outside are of Sandwich type information and available in standard, modular lengths to suit the requirement. The inner insulated center of the sandwich panels is made of Polyurethane version suitable for above use with average density of 40 Kg/M. The automatic foaming machine regulates the volume and high pressure injection. The polyurethane ( PUF ) in between the 2 skins. 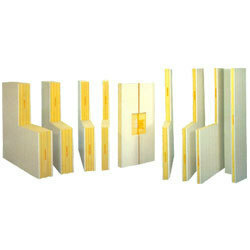 Panels range of thickness from 60 mm to 200 mm. The prefabricated panels can be expanded to form required shape by connecting a male female type of attachment implanted in the panels at site and further made totally leak proof using fine spray polyurethane resins at the site. Available with us is a comprehensive range of 30mm to 100mm PUF Roofing Panels & Insulated Roofing Panels. These are widely used for the purpose of roofing in different areas. Our panels are the high-tech machines that are used for various purposes. These are made using high quality polyurethane foam and are widely used in the industries and households. These roofing panels are available at competitive prices. 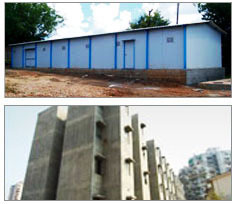 We are a renowned manufacturer and supplier of PUF Insulated Panels, which are carefully designed in accordance with the specific industrial norms and standards. These panels are widely demanded in varied industries for their quality and sturdiness. Our experts design the entire range carefully using quality material and advanced technology. Roof Insulated Panel offers long life, low maintenance and excellent weather tightness. Overlap joints eliminates the possibility of water leakage along side joints. Larger the panel size reduces the number of joints. These can be applied on new metal building construction or even applied on a substructure, over an existing conventional roof. 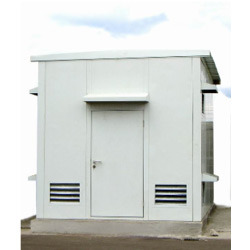 Made from high-grade sandwich panels with PUF used in its core, Sintex BTS shelters give excellent insulation for housing telecom and electronic equipments. These BTS shelter's insulated walls along with proper air conditioning and thermal management systems bring about huge savings.